Cucumbers = summer. Every year, when I plan my garden, somewhere in the back of mind lives a picture of pickling and cucumber soup and gazpacho. Yet, somehow, this dream never translates to reality. In fact, in the now four years that I’ve been gardening, I have yet to successfully grow a cucumber. This year the plants died before they even flowered. And I don’t know why. But, while I have not yet realized my cucumber dreams, I did have to get busy when a friend at work was drowning in cucumbers, which apparently thrived this year in gardens other than mine. Initially I was going to make cucumber soup. But that seemed impractical given that I had no plans for a dinner party and can only eat so much cucumber soup in two days. I wasn’t up for pickling. Plus I really needed some food food. So, as I often do, I looked to Mark Bittman’s How To Cook Everything Vegetarian for inspiration. And I found it: Barley salad with cucumbers in a yogurt dressing. Finally, a way to turn tzatziki sauce into a main course! The original recipe sounded totally fine. But I decided it could be better, both more flavorful and more substantial. Although my little garden hasn’t been super abundant, I am getting a few tomatoes, so that was an obvious choice. Bittman’s recipe called for dill, parsley, and/or mint. It was a tough choice, because I love dill. But I had parsley and mint. And the freshness of both herbs sounded perfect in the summer heat wave we’re having right now. As for adding substance, of course I knew I would add beans. But what kind? I briefly considered Mortgage Lifter and Scarlet Runner beans, two enormous heirloom varieties with a hearty texture that would contrast nicely with the chew of the barley and the crunch of the cucumber. Yet neither bean satisfied my mental taste buds. I wanted something fresh. Something summery. From past experience I knew that chickpeas make a perfect salad bean, soaking up flavors while maintaining a firm bite. Once they came up, I realized they were the perfect complement for the Mediterranean flavors of this light summer salad. And so it was. This salad is pretty perfect. Thank you, Mr. Bittman, for the inspiration. Oh, and if you want to make this gluten free, substitute wild rice or quinoa for the barley. (http://www.care2.com/greenliving/eleven-gluten-free-grains.html?page=1) If you go with wild rice, know that it takes about an hour. 1. Rinse the barley. Place it in a saucepan with 3 cups of water and a generous pinch of salt. Bring to a boil, reduce the heat, and simmer for 20 minutes or until the barley is tender. Drain the barley and spread on a plate to cool. Or, if you’re in a rush, run the barley under cold water. 2. While the barley is cooking, cut the cucumbers into bite-size chunks. If you’re using a cucumber for the grocery store, I recommend peeling off the waxy skin. Otherwise, leave the skin on. Either way, put the chunks in a colander, toss with a tablespoon of salt (I used kosher salt), and let it sit in the sink for about 20 minutes. Rinse and drain. 3. Whisk the lemon juice, olive oil, and yogurt together. Combine the chickpeas, barley, cucumbers, and tomatoes with the herbs and the dressing. Taste, adjust the seasoning as needed, and serve. *Canned chickpeas would be okay in this. But in my experience, dried beans that you cook yourself taste infinitely better. And it really is pretty easy. For this recipe, I used about a half cup of dried chickpeas. I soaked them all day while I was at work. Then, when I got home, I cooked them for about 1-1/2 hours with a 1″ piece of kombu. When they were tender I added about a teaspoon of salt and let the beans cool in the cooking liquid. This process allows the salt to thoroughly season the beans. Once they’re cool, drain, rinse, and add them to the salad. Traditionally, summer is not the height of soup season. But I love soup. Plus I had an emergency situation. A friend invited me to raid her garden while she was out of town. So I came home with what seemed like a modest amount of kale. At least, it seemed like a modest amount in comparison to what I left untouched. She has a lot of kale. 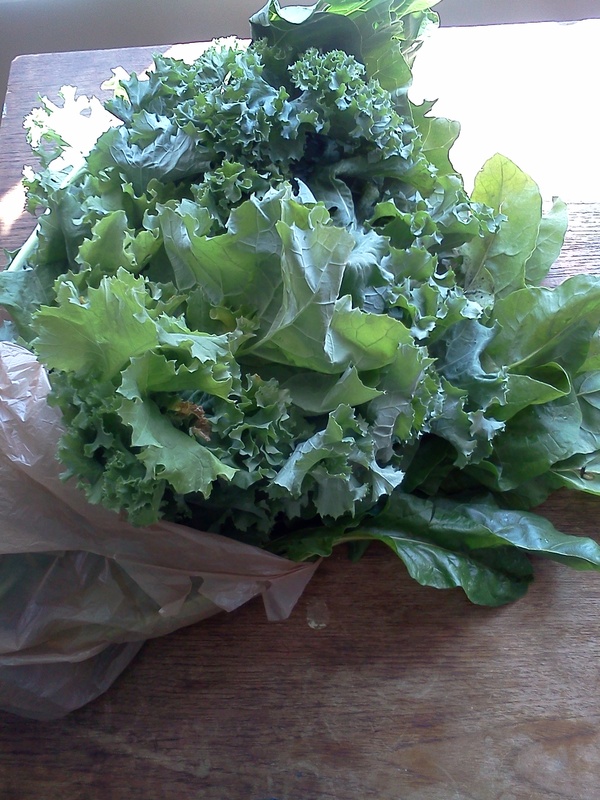 So, when I was next to the plants, the single bagful seemed like maybe enough for a couple of salads. When I got home, however, my scale slid back to reality. The bag full of kale I’d picked, thinking I was being so moderate, was probably the equivalent of 5 or 6 bundles from the grocery store. And I’m one person. What was I going to do with it all? Suddenly I was overwhelmed. It was Friday evening and I was home relatively early, looking forward to a rare night at home. I still had enchiladas in the fridge and didn’t feel like cooking. And yet. I had picked the kale. I had a responsibility to eat it. But my next seven days loomed as a series of full days followed by full nights, with no time to cook. Whatever I was going to do, I had to do it now. I settled on kale chips. Exhausted, but determined, I dutifully washed the dirt off, removed a couple of slugs, and stripped the leaves from the stems. So far, so good. Then, suddenly, I stopped. What was I doing? I was not having a good time. I didn’t want kale chips. And not only that, but I didn’t want to turn on the oven. It was going to make the perfectly temperate kitchen hot. Plus I didn’t want to cook. I didn’t want to do anything. What did I want? As I stood in the kitchen, surrounded by kale, it hit me. I’m a single person with no children or anyone at all relying on me. Sometimes it is heartbreakingly lonely. I’m often terrified by the future, so different from what I expected, what I used to have. There’s so much loss. But there’s also an amazing freedom in this life I’m building for myself. I have no one to please except myself. Which means, if I’m so inclined on a Friday evening at home, I am free to do nothing. I just forgot for a minute. Which is pretty funny given the amount of time I spend doing yoga, trying to breathe and focus on being present. I love yoga. It makes me happy. But all that yoga is meaningless if my happiness is limited to the time I spend on the mat. Bemused, I forced myself to put the washed, stripped kale away, stuffing it all into a gallon-sized ziplock bag, feeling good about taming the mass into such a neat package. Then I retreated from the world for the next few hours. I laid on the couch, went through Netflix, and wound up watching the very funny romantic comedy, Kissing Jessica Stein. Purged by laughter, I went to sleep at peace. The next morning I woke up super early. I planned to go to yoga before putting in a full day at the office. So I went to grab some food from the fridge, for lunch. And I noticed that the kale looked a little too green, wetter than it should be. In my eagerness to package it up the night before, I’d not thought about longevity. It was already starting to decompose. If I didn’t do something, all the kale would be wasted. I checked the clock. I had a half hour. That was enough time to throw something in the slow cooker. But what? 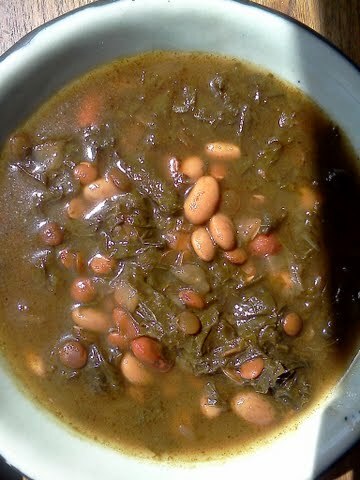 I looked up kale in Not Your Mother’s Slowcooker Cookbook (http://www.amazon.com/dp/1558322450) and found a recipe for many bean soup with kale. I didn’t have the prepackaged soup mix. But I had something better: an entire cabinet full of beans. Problem solved! And so it was. The downside was that of course it took more than a half hour. Which made me late for yoga. Late enough that although I went to the studio, I couldn’t force myself to interrupt the class by walking in so late. But it all worked out. Just not the way I’d planned. A lesson that maybe I’ll learn one of these days. Maybe. For now, here’s the recipe for the soup. It turned out well. 1. Wash, destem, and slice the kale thinly. 2. Heat the olive oil in a medium cast-iron (or other) skillet over medium-high heat. When it’s hot, add the onion. Saute for 5 minutes or so, until the onion is browning, then add the tomato paste. Saute for another 2-3 minutes, stirring, then turn off the heat. 3. Pick out any discolored or broken beans, rinse, and place in the slow cooker insert. Nestle the kombu pieces down in the beans then add the kale. It will seem like a lot, possibly coming up out of the slow cooker. Scrape the warm onion mixture over the top of the kale and use tongs to gently mix the onion into the top of the kale. The heat should help it shrink down a little. Cover with the chicken broth and water, and, using the tongs (or a big spoon), mix things around a bit so the kale is coated with the cooking liquid and beans are under liquid. Cover and cook on low for 10+ hours.